We have swapped thousands and thousands of cans of food for Resene testpots. All canned food is being passed onto local foodbanks for those in need. Thank you to everyone who took part. We hope you’re enjoying your testpots of Resene colour! We’d love to see what you paint with them – you can email photos to update@resene.co.nz, post a photo on our Facebook page or tag us in on Instagram @resenecolour. 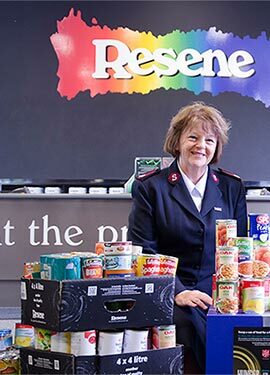 Back for its firth year, the Resene Hunger for Colour campaign has proved popular with keen decorators all over New Zealand, with over 39,000 cans of food swapped for testpots of Resene paint. The month-long campaign has helped restock shelves of Salvation Army foodbanks around the country. In five years the campaign has collected over 189,000 cans of food to support struggling New Zealanders. Every week we make up food parcels for individuals and families unable to meet their food costs. Our food parcels provide a hand up to those in need. Working with our budget advisors our clients can redirect the money they would normally spend on household food to address short term costs or debt. Over a period this regular food assistance can help families get out of debt and get on top of their living costs. Our food parcels are generally made up in large banana boxes by our staff and many volunteers who come to our food banks each week to help out. Volunteers come from all walks of life and include people who have previously received food or other help, members of community organisations and staff from corporates wanting to help out. In some locations people on community service also help out. Most of the food in our food parcels comes from generous businesses and individuals who donate unwanted fresh and non-perishable goods to our local food banks. Some of this food is produced specifically for us (such as the fresh bread delivered to 10 centres by Goodman Fielder each week) while other food is no longer saleable because it is nearing its best before date, has marked packaging or is no longer required by customers. In some cases, the volumes donated are very large and are delivered by the manufacturer by the pallet to our larger food banks which are equipped with forklifts and large storage facilities for chilled, frozen and ambient goods. Smaller, often regular donations such as from supermarkets and local businesses or growers are collected weekly by our staff in our vans and small trucks. Our food donations are unpacked and stored in our food bank shelves until they are needed. Because we rely so heavily on donations, the amount of food we have in our food banks varies a lot through the year. At times, especially in winter when the rate of donations seems to reduce, our shelves can be pretty empty which we find stressful as demand for our food parcels is constant throughout the year and our budgets only allow top up food purchases rather than core purchases. The period after Christmas is also a challenge for us and we are very grateful for donations at this time. Our food parcels are packed each week with the core non-perishable items such as canned food, rice, pasta, cereals, beverages and toiletries etc. As well as the core items for meals, we include snack items for school lunches such as muesli bars, nuts etc. Any fresh or chilled food items we have are placed in the food parcel just before it is given to our clients. Our clients are so grateful for these food parcels. Seeing the joy and relief they provide is enormously rewarding for everyone involved. All food parcels given out to clients are recorded in our database. This helps us understand the pattern of demand over time and across the country and enables us to better match demand with the help needed.